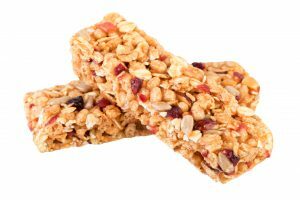 They may be a handy grab-and-go snack but cereal bars aren’t always as healthy as they seem and many of them are packed with sugar. If you’re in the habit of using a cereal bar to keep you going then you could easily be having the same amount of sugar as a chocolate bar and this won’t help your energy levels or your waistline. For a snack to be effective, it needs to contain good levels of both protein and fibre. This is a combination which will keep your blood sugar balanced by slowing down the release of sugars into the blood, keeping you fuller for longer and providing sustained energy. The body will burn through high-sugar snacks very quickly leading to the energy slump and sugar or carb cravings which are characteristic of a blood sugar crash. Next time you’re picking up a cereal bar, check the label carefully – 4g of sugar is the equivalent of a teaspoon, so you can easily do the maths. Some products contain 6 or more teaspoons of sugar! This isn’t always refined sugar, so don’t be fooled: lots of brands use dates or other dried fruits to sweeten their bars and while these are more nutritious than refined sugar, the impact on your blood sugar levels will be the same. A date is made up of 65% sugar and a medium-sized date contains the equivalent of about 6 teaspoons of sugar, so this is definitely one to watch. The higher the protein content of the bar, the longer it will keep you going, whether you’re planning a trip to the gym or have to stay late at work. Anything that has more than 8g of protein is likely to be a winner in energy terms and will help keep the munchies at bay. Foods rich in complex carbohydrate such as oats, nuts and seeds are also an essential part of a good cereal bar. These contain good levels of fibre which the body will break down more slowly than refined carbohydrate, which regulates the release of sugars into the blood. In short, aim for a ratio of high protein and fibre to low sugar and you’ll be onto a winner. Here’s my analysis of some of the popular cereal bar brands so you can see how healthy and effective they are as a quick snack. I’ve tried to select fairly similar products from each brand, so that the comparisons are as meaningful as possible. Each product is rated out of 5. The scoring is based on both the selected product but also the range in general, which will give you an idea about how selective you need to be with each different brand. Even allowing for the larger size, this organic bar is packed with protein, derived from a combination of cashews and a blend of pea, rice and hemp protein. The texture is nicely soft and the orange flavour adds zing. The downside is that the high date content makes it a pretty sugary offering with the equivalent of about 4 teaspoons of sugar per bar. It would benefit from a bit more fibre to neutralise all that sugar, but there’s no doubt that any of the Body Me bars would keep you going nicely. While this product is high in protein and fibre, it features multiple forms of refined sugar which isn’t good news for your blood sugar balance. The extensive list of ingredients and additives makes it a far more processed product than most of the others on this list. It might keep you going in the short term, but it’s not terribly nutritious. These small protein balls are quite dense and chewy, but they might not keep you going as long as you’d imagine. Across, the range, these balls tend to be lower in protein and fibre and higher in sugar than this specific product, with some of them containing the equivalent of 5 teaspoons of sugar, due to the high content of dates and other dried fruit. It’s best to be selective with this brand if you want the best results. If you’re familiar with the soft, sweet consistency of a Nakd bar, it’ll come as no surprise to learn that over half of the ingredients are dried fruit, so this is a pretty sugary option which is unlikely to keep you going for very long. However they do get a bonus point for the lack of additives and for their simplicity, which makes them suitable for people avoiding dairy and gluten. This product is a chocolate-topped flapjack rather than a traditional cereal bar, but despite the name it contains less protein, gram for gram than several of the products reviewed here. While Trek bars have the advantage of containing oats which are a great source of slow-release complex carbohydrate, the range is sweetened with added cane sugar rather than using the sugar intrinsic to fruit or dried fruit, so they’re not as nutritious as they could be. With sugar the second, third and fourth ingredients on the list and featuring six times in total, this is never going to be the most nutritious option. The intensive blast of sugar will create a blood sugar spike, followed by an energy slump which leaves you craving sugar or carbs. Despite the name, it’s frankly not much better than a chocolate bar. High in protein, these bars contain a combination of cashews with rice and pea protein. While they are slightly dense, there’s no doubt that they will give you a massive energy boost and the orange oil flavour makes it very tasty. The high protein and fibre content and the low sugar content make Pulsin’s Protein Booster range a winner. While the protein-fibre-sugar ratio looks very positive, this bar has a lengthy list of ingredients which include a number of additives, such as the artificial sweetener maltodextrin. This makes it quite a processed offering which may be harder for your body to break down and absorb. Be selective across the range, as some Nature Valley bars contain half the protein and twice the sugar of this one. Low in protein and fibre and with the equivalent of 4 teaspoons of sugar, this isn’t a great option in energy terms. The sugar content is consistently high across the range and the protein content varies from 2g to 9g depending on the product. Even the so-called ‘high in fibre version’ only contains 3.5g per bar, so read the label with care if this is your cereal bar of choice. These products are unlikely to keep you going for very long. The good thing about Bounce Balls is that they avoid using dried fruits, so the sugar content is invariably a bit lower than other brands of cereal bar. This product contains less protein than the rest of the range which is nearer 12g per ball, so you can be sure to get a good blast of protein from a combination of nuts and seeds, whichever one you choose. Although the fibre content could be better, the ratio of high protein to low sugar makes this a great blood sugar-balancing option which will definitely keep you going. The very broad distribution of this range in supermarkets makes it an easy ‘grab-and-go’ option if you’re after a quick snack but you’d be well advised to take a bit more time to find something better. Super-high in sugar for such a small bar and with virtually no fibre and very little protein to neutralise the impact, these products are going to leave you wanting more in a very short space of time. This isn’t the best of the 9:Nine bar offerings but, even so, it contains a decent amount of protein. Their Classic range gets a bonus point for being lower in sugar than the Breakfast range and for using pumpkin and sunflower seeds which provide a great boost of omega 3, as well as protein. One of the Classic bars is definitely worth considering if you’re looking for a quick energy boost. High in sugar, with minimal protein and fibre, snacking on this Frusli bar won’t get you very far in energy terms and you’re likely to soon have the munchies again. Their Absolute Nut Bar is a more convincing offering, containing 3 times as much protein, as well as being lower in sugar but the rest of the range is disappointing. 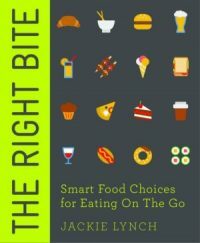 There’s more practical advice like this in my book, The Right Bite: Smart Food Choices for Eating on the Go. It’s full of useful foodie insights for the coffee bar, pub, takeaway food and more.